defend us against Denial of Service attacks. Be our protection against the bots and packets of black hats. whose packets roam throughout the network seeking the downing of sites. But is it drying up? I don't know. My fervent prayer is that nothing in this blog comes from me, but from the Holy Spirit. I've also had a strategy at the back of my mind from ages ago that I needn't really say anything original, only things already said (and better!) by others, e.g., from the Bible, Church Fathers, our dearest saints, the Church in her official decrees, as well as today's most talented bloggers and writers. I've had plans for this blog from the beginning, but I've rarely engaged the topic of Christian unity. It is either that I get easily distracted by other issues, in which case, as Og Mandino once warned in the God Memorandum, I was everywhere and went nowhere, or I am a coward. I hate confrontation, but ironically, it was a Baptist who was bludgeoning me with prooftexts and brimstone who told me that I'd have to step on toes in the process of saying something of significance. It's been two years, and quo vadis, Jeff? Who knows? For now, I'm just blogged out because work, family, the new house, the garden, a possible job change.. LIFE is becoming overwhelming, even as it continues to be more enjoyable and wondrous. In the meantime, however, I strongly recommend my favorite blogs in my blogroll. Mark Shea, Amy Welborn, Jimmy Akin and Jeff Miller are my favorites. Working moms and obese kids -- a connection? No, it doesn't mean that working moms are to blame. It just means what we already know: we REALLY need our mothers. God bless mothers! 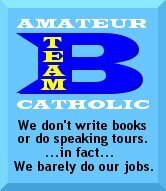 Everyone beware: here comes amateur Catholic trouble! Ms Lissner said men want to take responsibility and control of contraception. She said: "At least in the US, the idea that men aren't willing to participate is clearly out of date. "Men want to control their own destinies." I'd be interested to see the conclusive data on that. I'm not saying that it's impossible, but it doesn't sound plausible. From the last half of the 20th century on, the trend has been more about hedonism without consequences, rather than responsibility. One can hope, of course, but if men really wanted to take responsibility, why pull punches? If they're really responsible, they can commit to marriage, with their wife plan (and if you're a believer, PRAY about) how many kids they should have, work out how many years in-between to space their births, and use the Billings Ovulation Method. It's probably not what most people think (the outdated rhythm method), and it can be learned together by the couple, who will share the responsibility. There's another area of responsibility that's lacking in reality: what sort of man would opt to abort his own child and endanger the life and health of his wife? Both abortion and artificial contraceptives present serious health risks -- although it's true that many are not aware of this. What sort of man would have a sexual relationship with his girlfriend without first committing to marriage for life? This male contraceptive sounds to me like just another licence for sexual gratification without responsiblity. This sort of thing wouldn't be as much a problem if society hadn't turned its back on the idea of basic respect for human beings. It's the whole notion that one does not deserve respect until it has been earned. I don't know when it started, but it should have been recognized as a precursor to things like age discrimination. When utilitarian views about our worth become the norm, how else can we expect society to view the elderly? How can the East and West be one again? It just came to my head that perhaps the scenario isn't as complicated as it could be. I just realized what a great thing it would be for the Church to be able to pull out all our clergy from Orthodox sees and send them off where they are more sorely needed. After all, if the Orthodox Church comes back to full communion with the Roman Catholic Church, it only stands to reason that they can take over the Catholic communities as well. After all, they already have valid sacraments and theology. And what a sign to the world it would be for the Schism to finally end! There is currently a documentary on SBS running, one that explores the minds of the soldiers who perpetrated the Jewish genocide during World War II and those who did the same against the Muslims and Croats in Serbia. The narrator cited that the "us or them" thought was common among all genocides. To such people, the prevailing thought was "to survive, I must kill you." I realized with a shudder that this is exactly what pro-abortion lobbyists are saying about mothers and the unborn. "In order for me (the woman) to surive, I must kill you (the fetus)." It is a false dilemma, and a deadly one. Which means that he often espouses a noticeable departure from orthodoxy. But not heresy, I think, as he is very careful to present his ideas as talking points, not as Final Answers. But two days in a row is straining my heart. Sunday, he was talking about the shortage of priests, and suggesting that perhaps this is an opportunity for the Church to ordain married men. Okay, that's not too bad, given that celibacy is a discipline and a tradition (small 't'), but I had the impression that the numbers of seminarians were actually picking up -- particular in those places where people and their pastors were, you know, orthodox. Anyway, next he talks about broadening the role of lay people in ministry. No problem, not even when he talks about women in ministry. There's women who may be pastors and there's priests. Totally different things. I had no problem with a Dominican sister who was in charge of religious education in my school, or a lay woman (whom we lovingly called Mama Chu) was director of the university's campus ministry. At least he didn't mention ordaining them as priests. So I guess it wasn't too bad, but his homily raised my eyebrows some, but not too much. Monday morning Mass and he's at it a bit more. It's a celebration of the holy guardian angels. Scripture is full of references to them, some of them are given names and big roles, while others were mentioned in general references only. So why was our beloved (and we do love him) Father Michael talking about angels in Scripture as simply part of the "literary form" (therefore fictitious)? Why does he suggest that they were borrowed by the Hebrews heavily from Persian literature? The thought of a strand being pulled apart, unraveling the tapestry, came to mind. Take out angels and you wipe out a lot of Scriptural accounts, and a lot of theology. The untenability of his exegetical venture was accentuated by the liturgy itself, which, for this day, was full of Scriptural quotes about the holy angels. I don't know if he realized what a serious exegetical proposition that was. If angels were no more than literary devices, borrowed from Persian myths to provide form to the guidance of God, then what does that make of the Devil? If he's a literary form, what is he an agent of? Surely not our God! And what of the Lord's command to make figures of angels covering the tabernacle with their wings? Surely Moses did not risk the Lord's wrath and jealousy in order to provide the tabernacle with embellishments from figures of.. Persian mythological creatures! I have no problems with a homily asserting that the holy angels are best seen in the light of God's providence, as agents of his constant care for his children. To Him be the power and the glory! Amen! But God is not so insecure as to require solo billing. He gets top billing, sure, and the angels themselves would be the first to ask this. But to lower the angels to the level of mythical beings included in Scripture by the Holy Spirit's inspiration as mere literary forms.. insults their Master as much as it insults them. I am one of Father Michael's many happy children in our parish. He is a very able preacher, a compassionate confessor and my kids love him. But I think, in this instance, he may have let the academic in him get the better of the priest in him. Much as it happens to me a lot, being an academic myself. Sometimes, ideas, theories, exciting new branches of our sciences can get away from us. There must be a reason why the Lord told his disciples not to worry about what they needed to say when they are brought into courts. Perhaps it is for the same reason that the Lord mandated the Magisterium,lest we each try our hand at pontificating, and give in to temptations of over-reaching and creativity in overdrive. TOMORROW & WEDNESDAY: PRO-LIFERS TO DELUGE STATE PARLIAMENT WITH CALLS, FAXES & EMAILS. A quick reminder for pro-life people: we want to inundate the phones, faxes and email inboxes of the leading politicians listed below on the last two days of parliament (Tuesday & Wednesday). Please fax, phone and email ALL DAY on these two days, and be part of a state wide grass roots campaign to alert State leaders to our view that abortion is a grievous crime against humanity. The simple message, in your own words: "I oppose the decriminalisation of abortion. I cannot support parties or individuals who would vote for abortion up to the moment of birth. Please uphold the right to life of our brothers and sisters in the womb." Campaign Meeting at Right to Life on Wednesday 4th October. 7:30PM, 45 Nicholson Street, East Brunswick. Please come and continue to help us in this campaign. "But those who want to get rich fall into temptation and a snare and many foolish and harmful desires which plunge men into ruin and destruction. For the love of money is a root of all sorts of evil, and some by longing for it have wandered away from the faith and pierced themselves with many griefs. But flee from these things, you man of God, and pursue righteousness, godliness, faith, love, perseverance and gentleness." "If one of the brothers or one of the sisters is in need of clothes and has not enough food to live on, and one of you says to them, 'I wish you well; keep yourself warm and eat plenty,' without giving them these bare necessities of life, then what good is that?" He will answer them, 'Truly I say to you, to the extent that you did not do it to one of the least of these, you did not do it to Me.' And these will go off to eternal punishment, but the righteous to eternal life. It is cold comfort to give words but not food, shelter and clothing. But the world does not listen easily, and guess who loses big? ... 75% of young Catholics think it is proper to "pick and choose beliefs," while only 10% accept the notion that "only one religion is true." The overall impression left by the studies, the cardinal said, is that the beliefs of young Australian Catholics have gone "beyond tolerance and ecumenism and toward muddle." I've run afoul of this blogger before, and it's really hard to understand his mindset. I gather from his commenting rules (and the way he's enforced it and/or waved it at me a few times now that nothing is up for debate. He knows what he knows and he's not out here to reason with people. He'll say his piece and you take it or leave it. It's alien to my way of thinking about evangelizing. I'm not quite into entertaining new ideas to make my own. I do know what I know but I don't know what the person I talk to knows. I am interested in what makes them stand outside instead of coming inside the body of Christ. Knowing that much about them can only help me help them get over what's stopping them. I believe in dialogue, and first of all, non-Christians (and non-Catholics) that I might dialogue with deserve the utmost respect as human beings. That they believe in God in some form is a plus. I believe in taking things from what truths they believe in, e.g., the sanctity of human life, the existence of a God who loves us, as the foundation for hearing the Gospel. It is entirely up to the Holy Spirit to work in their hearts, but the preaching will go better if there is a common language, common experiences and common notions that we can build upon. For Rand the Baptist.. dialogue will not work because he won't let it begin. He does not wish to correspond nor to discuss anything. His mind and heart are closed. He knows what he knows. There is no testing the spirits for him. Only prayer can reach him. I just wish he knew what he was talking about when he talks about anything Catholic. He attacks Catholics with his misinformed knowledge and experiences, and there is no defense allowed the hapless Catholic. As I told him before, it is like this: from inside his house, he shoots at Catholics outside. When confronted, he retorts that they have no right to complain because his activities are done within the sanctity of his own home. And there is no dissuading him about this injustice. Making disciples of all: where do we start? It wasn't too surprising to find that some fundamentalist out there would find something to gloat about during the recent tantrums thrown among Muslims to protest Papa Benedict's Regensburg lecture. When our Pope clarified his position with the Muslims, and expressed regrets over the disproportionate offense taken by those who misunderstood, brother fundamentalist -- ex-Catholic Rand -- called it hypocrisy. What I found alarming was not quite what he had to say about the Pope and the Catholic Church -- it was expected. It was what he professed about Muslims and non-born-again Christians in general. Perhaps his understanding of evil is not the same as mine, but he asserts that there is absolutely no good, only total evil, among non-born-agains. Of course, in his mind, that includes me, but that's not the point. The problem is how he expects the Church (his notion or mine, it doesn't matter) to reach out to non-Christians. Respect is not a starting point for him, nor is the acknowledgment of something good -- even a minute amount -- in human beings per se: even babies, children, youth. Ironically, this was the point of that Regensburg lecture: God and reason go together, and one cannot profess a God who is entirely unreasonable. The example Papa Benedict gave was the irreconcilability of a reasonable God and violent or forced conversions. Here with Rand is another example of something irreconcilable: that God had created evil beings. By evil, I do mean that which is COMPLETELY anti-God, a total antithesis of love. Perhaps he equates "evil" with "sinfulness", which is not the same thing. For we are all sinful by nature, due to The Fall, and are prone to evil actions. But we are also capable of good actions, by the prompting of the Holy Spirit, even when we are not aware of it and do not acknowledge it. What I do fear is that such a concept will not yield much evangelical fruit. Isn't it reasonable to say that all human beings, regardless of their fallen nature, deserve respect? Even God shows us that much respect, by prompting us with the Holy Spirit into willfully embracing faith, rather than creating us incapable of free will, automatons programmed to do only what the Holy Spirit prompts. There is a pre-requisite of respect that must precede the dialogue of preaching the Gospel to non-believers. One may affirm, as the Magisterium does, that non-believers deserve respect, and may have pieces of the truth in what they believe. The problem is not that they have no truth at all, for God creates us in his image and likeness, and that which is his image is good. The problem is that non-believers do not have all the truth, having instead a mixture of truth and falsehood. It isn't unreasonable to use the truths they hold as a take-off point in a dialogue, a means to anchor the truths they have never heard nor understood before. Do they believe in a benevolent creator rather than the neo-Darwinist notion of life as pure accident? Then we affirm that they have, as Romans 1:19-20 suggests, perceived God in what can be observed from his creation. But we must take it a step further, and explain more truths that should supplant the falsehoods and half-truths. I just find it shocking that the same notion of a creator who is unreasonable and whimsical, can be found among Christians. I'm not sure if it's Calvinism or Occam's influence on Luther (and Calvin?). Whatever it is, there is a peril among Christians of such bent which renders their Christianity too similar to Islam in theology -- but thankfully, not in violent aberrations.